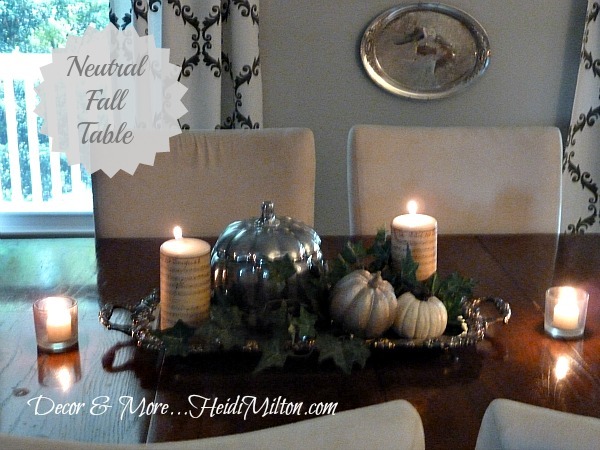 I’m so enjoying this touch of fall in my newly painted and decorated dining room! The traditional fall colors just wouldn’t feel right in this space, so I broke out my white ceramic pumpkin I bought at Target several years ago, and a spray-painted dollar store pumpkin I shared last fall. 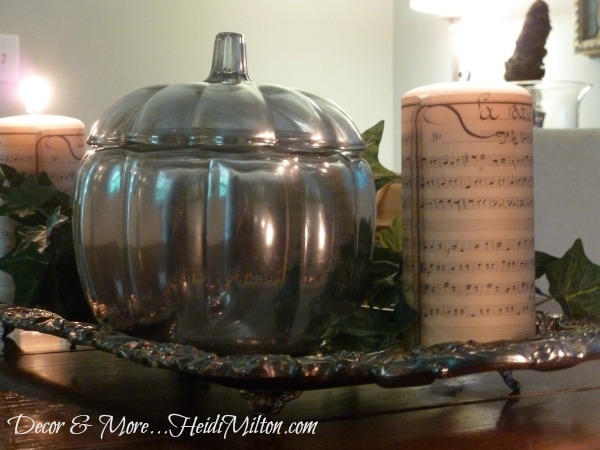 I added in some silk ivy on my silver footed tray and the French sheet music candles I made for Valentine’s Day. The vellum has a beautiful warm creamy patina, so they were the perfect cozy touch. and a can of Krylon Looking Glass spray paint. I did spray one coat on the inside of the pumpkin and the underside of the lid. Once that dried I sprayed two coats to the outside of each piece. See? Easy peasy. 🙂 This one’s a keeper. Don’t be surprised if it turns up again down the road! What kind of pumpkins are you using in your fall decor? hey Heidi- I just love these pumpkins. heading to walmart to get some supplies! I just made this project, too! Once you start using that spray you can’t stop! Love your styling and your photography! I LOVE it. 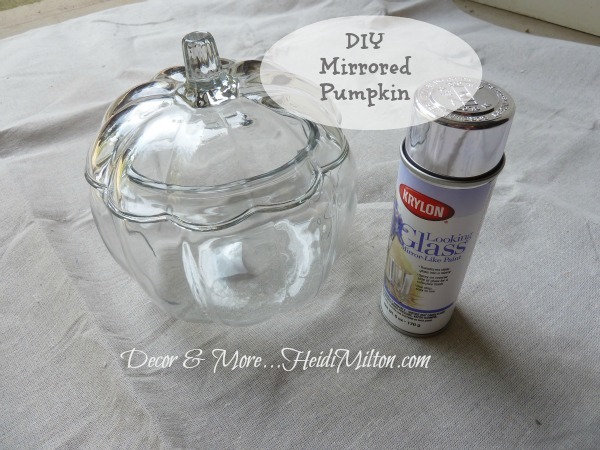 I have been dying to find some dollar store pumpkins and dress them up with some looking glass paint. If only I got my act together. OMG. 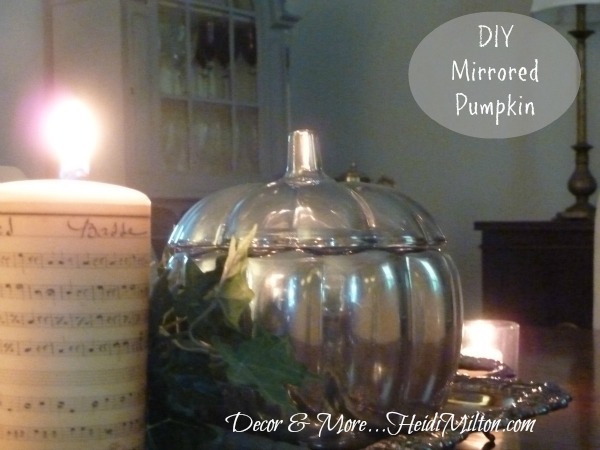 I LOOOOVE the mirrored pumpkin!! And for only $4.50? Craziness! It ROCKS. Kelly @ View Along the Way recently posted..Free printables and a laundry room sneak peek! SO simple and so stylish. Love it! Very nice pumpkin! I saw your link at Design, Dining and Diapers, so pretty! I love it….I need to get on the bandwagon and buy some of that paint!! !….Beautiful Heidi!! So pretty! You know I love the DIY mirrored look… so much cheaper than buying mercury glass items. And beautiful! Great job, Heidi! I shared this on my FB page.